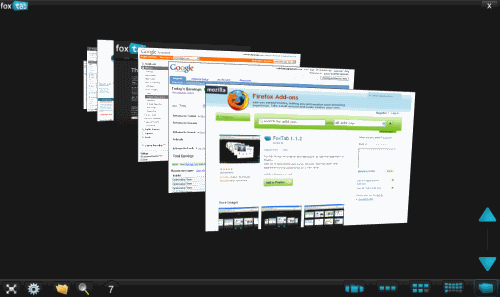 Mozilla Firefox browser is one of the most popular and useful web browser.Firefox empowered with addons/extension and themes making it flexible and easy for customization.There are number of addons which are useful and one such addon is Foxtab which gives innovative 3D functionality to your browser. ✔Easily flip between opened tabs using mouse or keyboard gestures.By clicking on a given thumbnail, the selected tab will be focused. Once you have installed the add-on just press the “launch FoxTab” button on your navigation toolbar and FoxTab will arrange all the tabs you have opened in a 3D “stack” which is tabs arranged one behind another. Just roll your mouse wheel or press the Ctrl-Tab keys to flip through the various tabs you have opened and click the one you want to go to. You can press the Ctrl-Q keys to keep it in a flip mode. So this is really useful firefox add-on. So just give it atry and Download FoxTab Firefox addon and visit their homepage to read more details about FoxTab.